This dish may look like Christmas, but the Washington Post ran it last year as part of a healthy Thanksgiving recipes article. 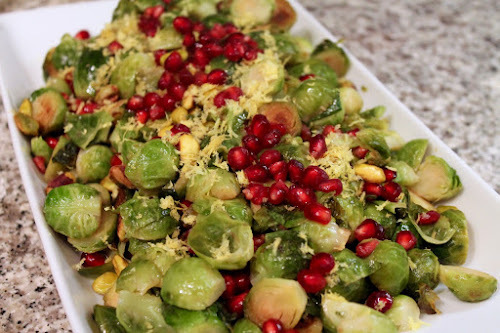 Brussels sprouts are always welcome at my Thanksgiving table, and this is a beautiful way to serve them. 1. Heat a large sauté pan over medium heat. Add the olive oil and the Brussels sprouts. Cook, stirring occasionally until the sprouts are a bright-green color and golden around the edges, about 10 minutes. Add the water, cover, reduce heat to medium-low and cook until the water has evaporated, about 5 minutes until the sprouts are tender. Season the sprouts with salt and pepper. 2. Transfer the cooked sprouts to a serving platter and top with the pomegranate seeds, pistachios, lemon zest and lemon juice.